. . . 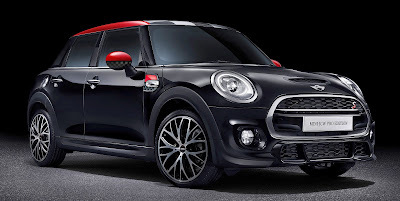 Mechanical changes are made up of the inclusion of a JCW Pro tuning kit, which consists of a performance-optimised engine update and a valve silencer system (RM10,000). The package is good enough to boost output on the base B48 2.0 litre four-cylinder turbo engine from 192 hp to 211 hp. Torque is also bumped up to 300 Nm from the standard 280Nm seen on the Cooper S 5 Door. As for the exhaust flap system, this one offers two sonic modes. There’s Sport for a full sound to accompany everyday driving and Track, which offers backfire pops and cracking for added visceral appeal. Selection can be done wirelessly via two clicks of the Bluetooth 4.0 controller. Carbon tailpipe trim (RM3,000) apply a finishing visual touch. . . .